The CRC group currently manages two Fused Deposition Modeling (FDM) 3D printers — a Lulzbot Taz 6 and a Flash Forge Creator Pro. The printers are both are located in the 3D printing vestibule in Coram 103. They are available for academic projects only, but because the Flash Forge is a precision instrument, it is available only for projects requiring professional quality. A training session on proper use of either printer is a prerequisite to printing. Interested users must contact Cori Hoover or complete a Request Form to schedule a training session. After receiving training, users will be able to reserve a printer using our Connect2 reservation system. 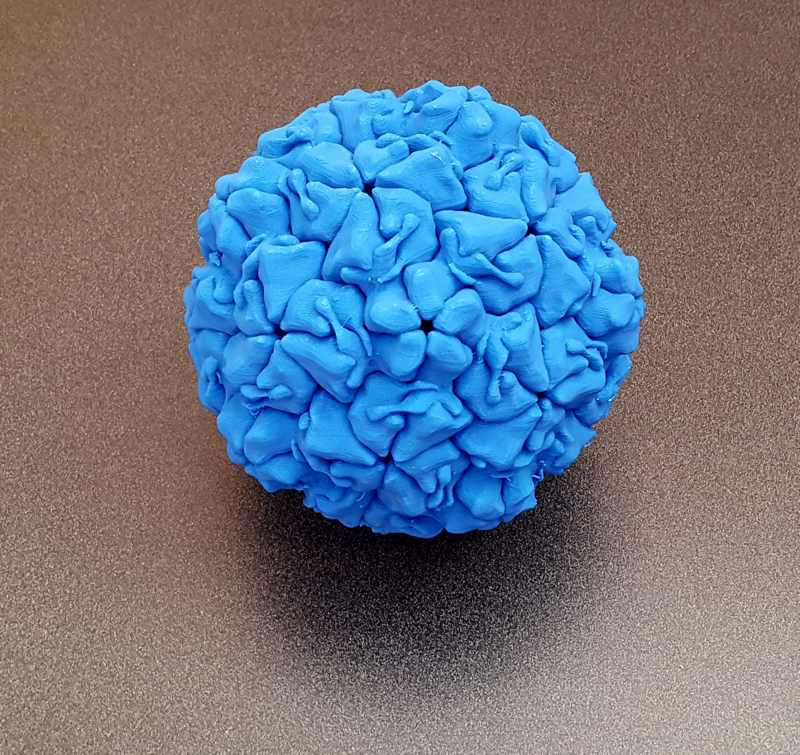 Our 3D printers have been used to support multiple faculty projects, ranging from the creation of custom set pieces for the theater department to printing classroom models for the biology and chemistry departments, such as the Rhinovirus print shown here (created for Bio 314-Virology). 3D printing generally requires two different kinds of software. The first, CAD (computer-aided design) or 3D modeling software, is used to create the computer model that will be sent to the printer. There are many different software packages that can be used for this, but some of the most popular are AutoCAD (which is free for students and faculty), Rhino, and Blender (free & open source). If you are new to 3D modeling, Tinkercad is a good place to start. There are also many specialized modeling programs available, such as Chimera from UCSF, which is used to create molecular models. It is also sometimes possible to 3D scan an object you would like to print, or to simply download a 3D model that has been created for you. There are an increasing number of model repositories online, such as MorphoSource, PDB-101, the Protein Data Bank, or Thingiverse. If you’d like to learn some of the fundamental concepts and history of 3D printing, see this handy guide by 3DInsider. 3DHubs.com also has a nice guide for designing parts for FDM printing available here.